Will not crack or peal Does not rub off on clothing Dries in just 30 minutes Permanent after 72 hours No need to heat set it Safe for indoor and outdoor use UV protector to reduce sun fading. 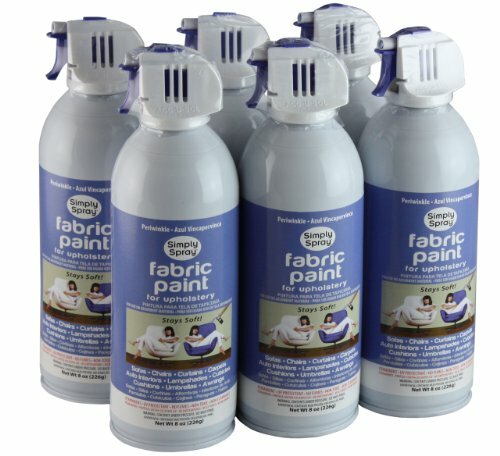 Washes off your hands easily with soap and water 8 oz cans Simply Spray is a permanent aerosol fabric paint, not a dye. It is non-toxic, non-flammable and completely safe. You can paint your upholstery instantly without the mess! All you have to do is pop the blue safety tab, apply even pressure to the trigger and simply spray! Great for use on furniture, awnings, umbrellas, camping supplies, office cubicles, material, RV's, boats, carpets, cloth car interiors, wood, silk, and more. This is for 6 cans. PMS#2727* PLEASE NOTE: Because Simply Spray is in a pressurized can, it CANNOT be shipped to APO, FPO or International addresses. *Please note the PMS color reflects the true color of the product which, may vary due to the calibration of your monitor as well as the material you choose to spray the paint on. If your project demands exact color matching we highly suggest testing on a hidden area first. Simply Spray is Safe for the Environment, ECO-FRIENDLY and Made in the USA Rhode Island to be exact. Simply Spray Paint is to be used on absorbent materials, make sure your material is absorbent by applying water to a small area and making sure the material absorbs the water. Does not work on all fabrics. Contact seller for suitability.